The holidays are fast approaching, and Nintendo had promised that Switch production would pick up ahead of Christmas this year. Well guess what: Nintendo kept its promise. 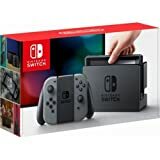 The Nintendo Switch is the hottest video game console on the planet right now, and it’s in stock on Amazon at its regular retail price of $299. You’ll get free Prime shipping on top of that if you’re a Prime subscriber, so you’ll have the Switch in your hands by Thursday. Whether you’re looking for a Switch for yourself or you’re planning to give one as a gift, now is the time to grab one!